This adult oriole has mastered a LOT of important skills. Baby orioles spend most of their time searching for food and eating as they grow independent. The baby orioles develop a keen eye for movement, which helps them to notice caterpillars and other tasty insects and spiders. They also get good at recognizing berries and fruits. It doesn't take long to learn which ones are sweet and which taste sour or bitter. But they won't have to learn everything the hard way. They hang out with their families and start associating with other orioles in small flocks. Experienced birds head off to the yummiest fruit trees, and the younger ones follow. During the night, young orioles mostly sleep. But sometimes they sit wide awake on their branches, looking at the sky. What are they thinking about? We don't know, but we do know that they look at the stars. They notice a very important thing: Most of the stars seem to move in the sky, but the north star holds still. This important knowledge will help them navigate during migration. As summer days grow shorter in August, the birds get restless. After napping a bit at sundown, they'll suddenly wake up and head south, flying high enough that they won't bonk into hills and trees in the dark. After a night of migrating, they'll be extra hungry in the morning! Autumn days are filled with eating and resting, and sometimes making low flights in the right direction (south) as they wend their way between feeding trees. Many birds get their heads caught in horsehair or other nesting fibers that strangle them while building a nest. At least one Baltimore Oriole was electrocuted when perched on an electrical wire. Orioles sometimes die by flying accidentally into communications towers during nighttime migration. Many are killed by flying into windows because they see trees and sky reflected and don't realize the glass is a barrier. Orioles are also attacked and eaten by Sharp-shinned Hawks, Cooper's Hawks, Goshawks, Merlins, American Kestrels, and Peregrine Falcons. Imagine YOU are a young oriole, starting out on your own in the big world. 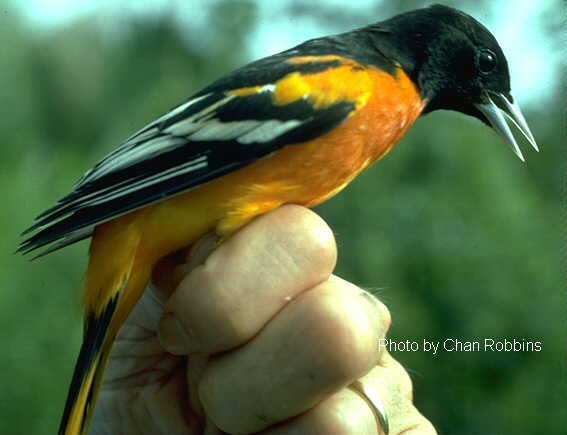 Which would you be—a Bullock's Oriole or a Baltimore Oriole? Why? (Think about their range maps and what you've learned in other Journey North reports.) What would be the best things about your days? The worst? The scariest? Would you love flying, or do you think it would get boring?